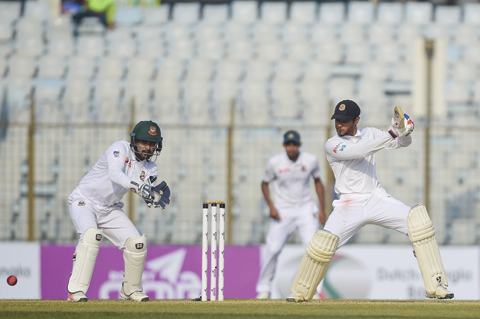 CHITTAGONG: Dhananjaya de Silva struck a century and shared 187 runs in an unbroken second wicket stand with Kushal Mendis as Sri Lanka gave a strong reply to Bangladesh in the first Test in Chittagong yesterday. De Silva made an unbeaten 104 while Mendis hit 83 not out, guiding Sri Lanka to 187-1 at stumps on the second day.Earlier, Rangana Herath and Suranga Lakmal took three wickets each to help the visitors dismiss Bangladesh for 513 in their first innings. The pair came together after spinner Mehedi Hasan got rid of Dimuth Karunaratne for a duck shortly after Bangladesh’s innings ended with skipper Mahmudullah Riyad unbeaten on 83. De Silva led Sri Lanka’s batting charge with his aggressive approach and brought his fourth Test hundred off 122 balls with a cover drive off left-arm spinner Taijul Islam. This is de Silva’s second successive Test century after scoring an unbeaten 119 in Sri Lanka’s last match against India in New Delhi in December. Bangladesh, who are now leading Sri Lanka by 326 runs, wasted two reviews against Mendis and also dropped two chances offered by the right-hander. Mehedi dropped Mendis on four off paceman Mustafizur Rahman at second slip, before Imrul Kayes grassed another chance-this time off Mehedi’s bowling-with the batsman on 57. The hosts, who resumed the day on 374-4, added 139 runs to their overnight score with Mahmudullah leading the charge on the second day. Mahmudullah added 58 runs with debutant Sunzamul Islam for the eighth wicket, after three quick wickets rattled the home side early in the morning. Spinner Herath brought Mominul Haque’s majestic knock to an end in the third over of the day when the left-handed batsman flicked a catch to Mendis at forward short-leg. He made 176. Mominul who hit 16 fours and a six, faced 214 balls and added just one run to his overnight score. Herath struck again as Mosaddek Hossain lofted a catch to Lakshan Sandakan at mid-on after making just eight.